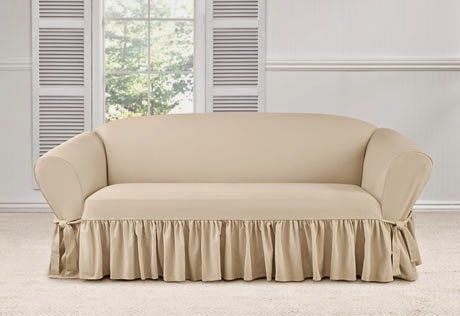 These valances have hung in our living room for over 10 years...oh yeah. time to make a change! 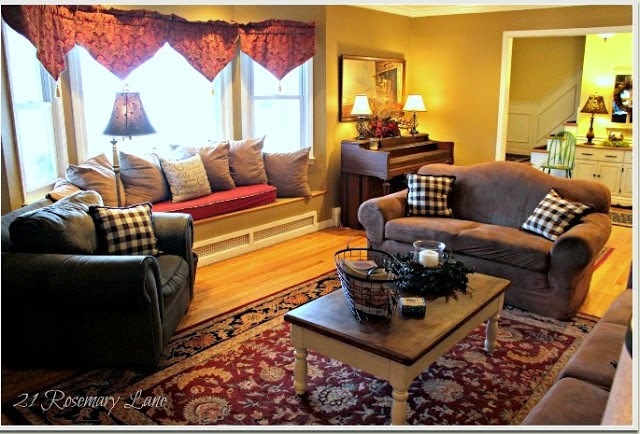 Along with the lighter wall color I opted for lighter window treatments. The bay window is the only source of natural light in this space so I wanted to make sure I was allowing as much light in as possible. Plus in the past I always felt like I was on a stage once the lights were switched on at night because there were no shades or window blinds to close for privacy. 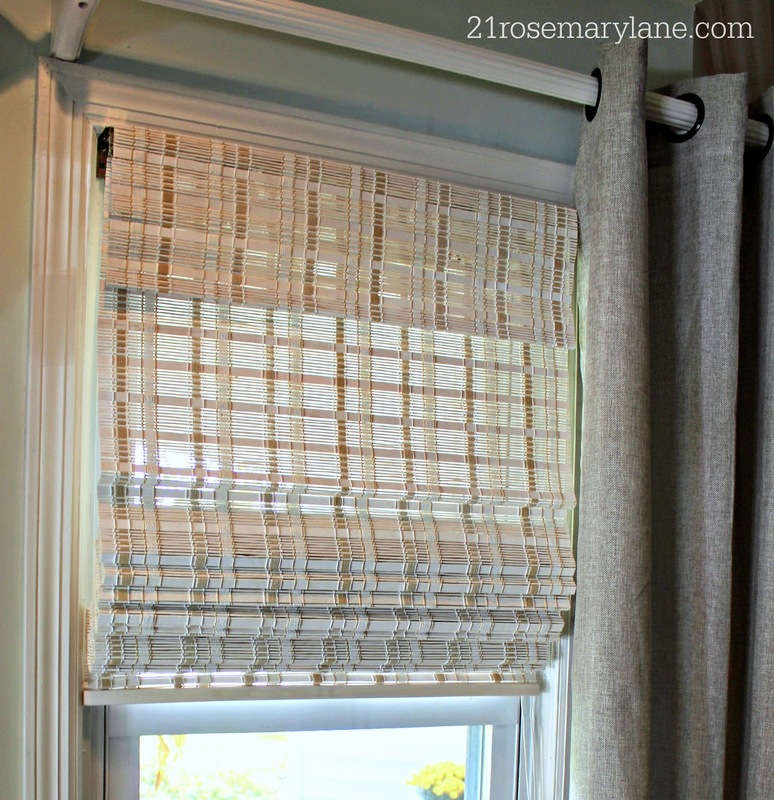 I really like the texture of the bamboo and linen together, it adds so much more interest to the rather large window. Then there is also the natural component of wood in regard to the 2 curtain rods of the flanking windows. 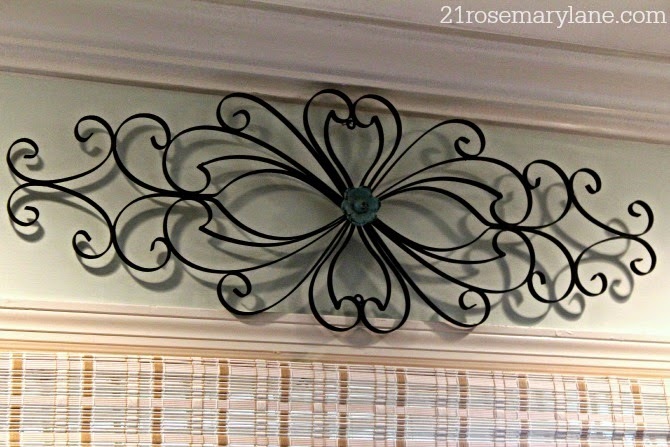 Another natural element comes in the way of an iron wall hanging I picked up at Hobby Lobby. It was hung above the large window to help fill in the blank space above the window and between the curtain rods. I would like to replace my slip covers with a Twill set I saw over at Sur-Fit. Also I wanted something with a relaxed fit and a bit more feminine in style. I think this one fits the bill. 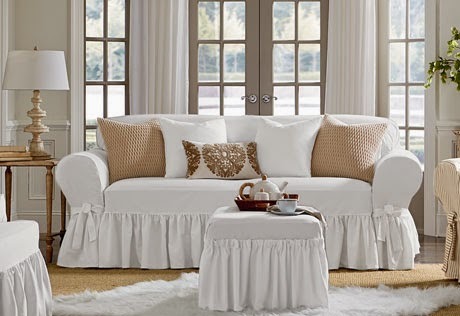 The wheat color will work well for the fall, but I really love the idea of the white for summer! I am still working on a gallery arrangement to put on the wall above our large sofa so currently I'm on the hunt for some weathered window shutters. 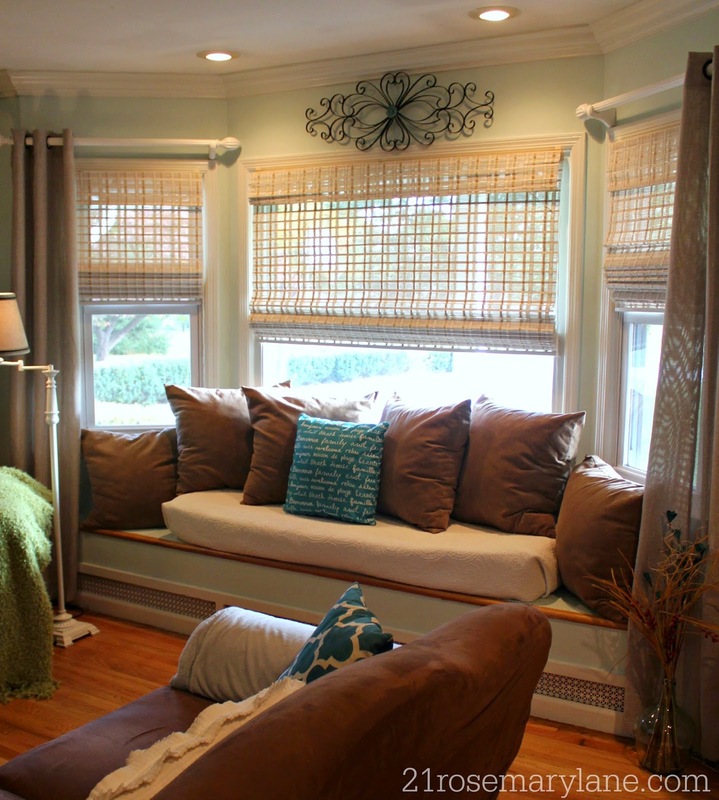 I'm also hoping to find coordinating fabric to recover both the window seat and it's large pillows. Or better yet maybe I'll purchase some pretty bolster pillows...we will have to see! So much to do...but it is all good! Curtain rods ~ The Martha Stewart collection at Home Depot. Hope you are throwing your windows open so to enjoy this fabulous early autumn weather! 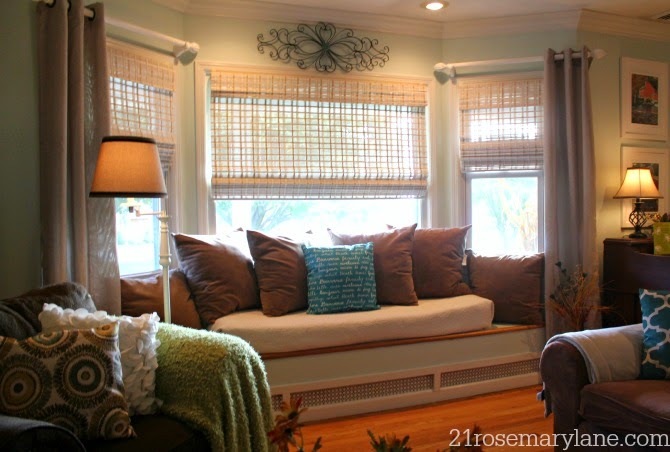 Your window seat area looks amazing! What a transformation the softer colors made. It's very pretty and welcoming. Oh I love it, the drapes and shades are fabulous. Wow, Barbara, a big difference, makes it look like you have new windows. So much brighter. Looks beautiful. 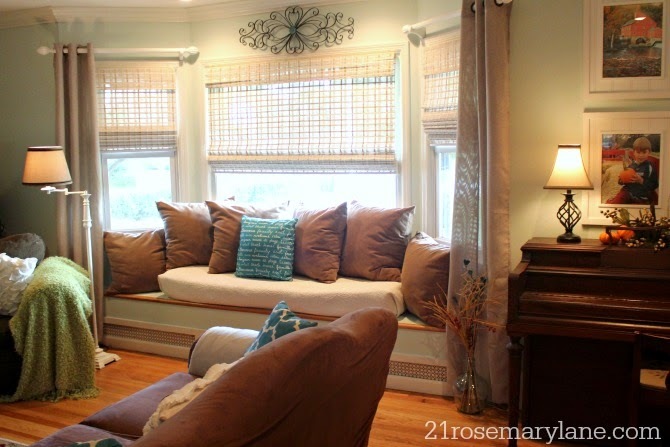 I can imagine how wonderful it is to curl up with a book in that window seat. Great transformation. Congratulations! 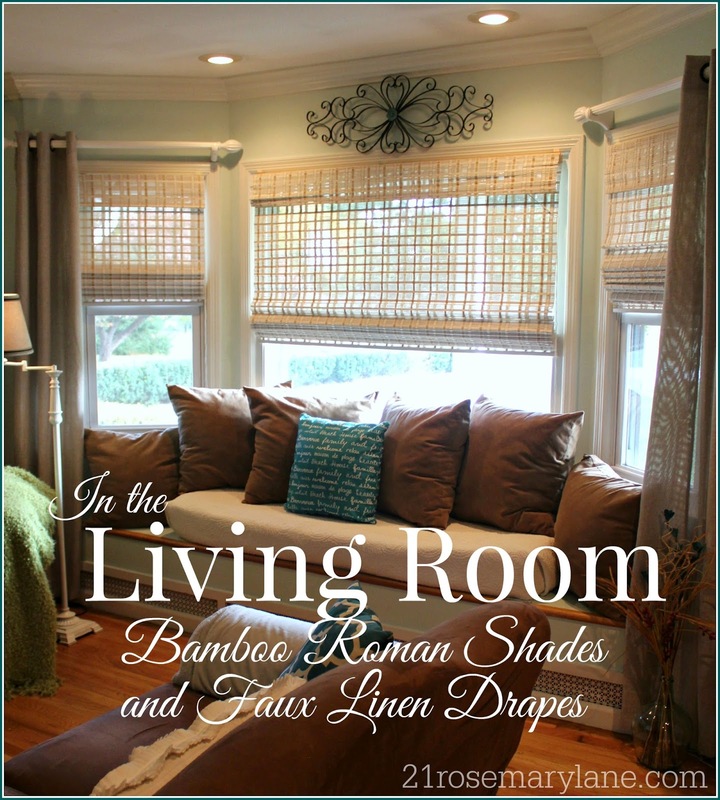 The color of the drapes and the fabric window blinds give an outstanding compliment to the living room and to its furniture. Furthermore, privacy is a major reason for people to fix curtains. What with complexes and apartments being constructed with minimum foot area and corridors, it has become essential to safeguard our security and privacy. Curtains prevent invaders to peep in and also provides comfort and a feeling of not being disturbed with the extra glare of lighting and vehicle movement. You can read more here.